There is a need for a new cardiovascular disease model that includes a wider range of relevant risk factors, in particular lifestyle factors, to aid targeting of interventions and improve population models of the impact of cardiovascular disease and preventive strategies. The model needs to be applicable to a wider population including different ethnic groups, different countries and to those with and without cardiovascular disease. This paper describes the construction of the Cardiovascular Health Improvement Model that aims to meet these requirements. An odds model is used. Information was taken from 2003 mortality statistics for England and Wales, the Health Survey for England 2003 and published data on relative risk in those with and without CVD and mean blood pressure values in hypertensives. The odds ratios used were taken from the INTERHEART study. 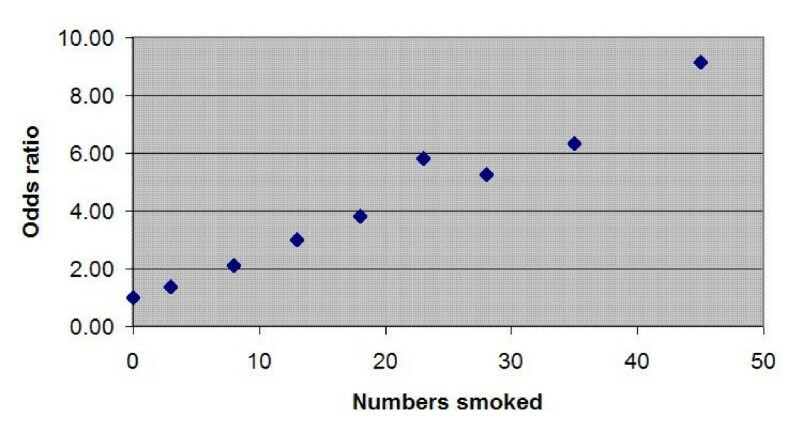 A worked example is given calculating the 10-year coronary heart disease risk for a 57 year-old non-diabetic male with no personal or family history of cardiovascular disease, who smokes 30 cigarettes a day and has a systolic blood pressure of 137 mmHg, a total cholesterol (TC) of 6.2 mmol/l, a high density lipoprotein (HDL) of 1.3 mol/l, and a body mass index of 21. He neither drinks regularly nor exercises. He can give no reliable information about his mental health or fruit and vegetable intake. His 10-year risk of CHD death is 2.47%. This paper demonstrates a method for developing a CHD risk model. Further improvements could be made to the model with additional information. The method is applicable to other causes of death. There are several reasons for calculating the risk of cardiovascular disease in an individual or a population. Health care providers need to model future patterns of need for health services, and to identify the cost effectiveness of different intervention strategies. [1, 2] Insurance companies and pension funds must evaluate risk in both individuals and populations when assessing portfolio risks. In clinical medicine, cardiovascular risk is increasingly accepted as the appropriate criterion to use to identify those who will most benefit from interventions designed to prevent cardiovascular disease and death. [3, 4] Another, perhaps overlooked requirement, is to inform shared decision-making with patients. This paper describes a cardiovascular disease (CVD) model which has been developed specifically for use in consultations with patients as an aid to risk communication and to shared decision making. Most CVD models focus on coronary heart disease (CHD) events, such as myocardial infarction. However, it is sometimes difficult to categorize an individual as either having or not having experienced a CHD event, since the collection of data on such events varies according to methods and definitions used. Consequently, an evaluation of all CHD or CVD events will be less reliable than one with a more concrete outcome measure such as CHD and CVD death. The model we propose therefore estimates death from CHD. Major cardiovascular risk models and their inputs and outputs. 4 to 12-year risk of CHD events and death, all CVD events and death, all cerebrovascular events, myocardial infarction events. 2-year risk of CHD events. 5 or 10-year risk of CHD event. Age, gender, smoking, BP, TC and residence in a 'high' or 'low' risk country. 10-year risk of death from CHD or CVD. 10-year risk of CHD event. Age, gender, smoking, BP, TC/HDL, body mass index (BMI), family history, treatment with antihypertensive drugs, Townsend area deprivation score. 10-year risk of CVD events. The best known estimators are the Framingham equations. These have been criticized for their inaccuracy in some countries, in particular Southern Europe where they tend to over-estimate risk significantly. This variation is an inevitable consequence of the exclusion of significant risk factors from the model. If a model is derived in a particular population, the prevalence and impact of any missing risk factors is tacitly embedded in coefficients of the risk equations. When applied to a population with different prevalences or one in which risk factors have different impacts, the model's predictions will be less accurate. Attempts have been made to recalibrate the Framingham equations for different ethnic groups in the United States and the United Kingdom. [11, 15] However, the recalibrated equations have not been validated and questions about their applicability to other geographic areas remain unanswered. The models in Table 1 all include age, gender, blood pressure, cholesterol, cigarette consumption and diabetes as risk factors. All omit some important independent risk factors such as family history, existing CVD, obesity but also diet, alcohol consumption and exercise. We are particularly interested in risk factors related to lifestyle: if an estimate of risk is to be used in consultations as part of discussions with patients about lifestyle modification, it is important that the estimate should include the fullest possible range of risk factors relating to lifestyle. This paper describes how to take publicly available information on CHD prevalence, CHD death rates and CHD risk factors, and use it to calculate the risk of coronary heart disease for individuals, using an approach that should be applicable in different geographical areas and different ethnic groups. where Pt is the probability of dying of cardiovascular disease in time t.
LNORs for each risk factor. In the following three subsections of the paper we explain (1) how estimates were derived for baseline CHD mortality, (2) choice of a set of risk factors, and (3) how adjusted LNORs were determined for each risk factor. We then go through a worked example for an individual patient. The mortality of CHD was extracted from the UK national mortality statistics 2003. The ICD-10 codes included for CHD were I20–I25 inclusive. A probability of death from CHD for each age band was calculated for each gender by dividing the number of deaths in the age band by the number of individuals in the population in that age band. The annual death rates for each age from 35 years-old upwards were then smoothly interpolated using methods described below. The probability of death was set to zero below the age of 35 as the death rates in this group were negligible. M = Mortality from CHD for that age and gender. M1 = Mortality from CHD in individuals without prior CVD. M2 = Mortality from CHD in individuals with prior CVD. Pr = Prevalence of CVD for that age and gender. and RR = the relative risk of CHD in those with a prior history of CVD compared to those without. Linear interpolation using the mid points of the 5-year age bands fails to preserve the area under the curve within the age bands where there is a high rate of change of risk. Also, the effect of the sharp changes in risk at the the mid-point inflections is magnified in subsequent calculations to give artefactual 'edge effects'. A key problem is that the area under the cumulative mortality curve needs to be conserved. A two-step process was developed in which a smoothing algorithm generates a curve which is then modeled as a weighted sum of sixteen Normal distribution curves. An interpolated curve is first generated by redistributing the area under the stepped curve obtained from the initial data: the sharpest angle in each age band is identified, by finding the biggest change in angle and dividing it by the absolute value of y-axis point. That data point is shifted towards the further of the two adjacent data points. The amount by which the data point is increased or decreased is then redistributed to the other data points in the age band. The process is repeated, iteratively reducing the maximum angle and resulting in a smooth curve that does not fall below zero, and preserves the area under the curve in each age band. Below the age of 35, the prevalence and mortality are set to zero. For ages 35 and above, a function of a set of normal distribution curves was generated from the points in the smoothed curve. This produces a more tractable equation. Generating all data points prior to finding the best fit function prevents Runge's phenomenon. The parameters and weightings – determined by the least squares method – of the Normal distributions are shown in Table 2. Figure 1 shows the result of the interpolation of coronary heart disease results against the original stepwise mortality for the five-year age bands. This curve can be generated using no more than 16 numbers, does not violate the normal bounds of probability, is not affected by Runge;s phenomenon, and preserves the total risk in each age band. The coefficients for the normal distribution curves for mortality and prevalence functions. showing the resulting curve generated for the risk of death from coronary heart disease in men compared to the original stepwise 5-year age band mortality. The most comprehensive data on the odds ratios associated with a set of risk factors has come from the INTERHEART study, which collected data from 15,152 patients admitted for a first MI at 262 centres in 52 countries across the world, and 14,820 matched controls. The INTERHEART study identified nine risk factors in addition to age and gender, which accounted for 90% of population attributable risk (PAR) in men and 94% in women for first myocardial infarction. We assume that the odds ratios for the risk of MI will be very similar to the odds ratios for CHD in general. The nine risk factors identified in addition to age and gender were: smoking status, a diagnosis of hypertension, apolipoprotein B/apolipoprotein A1 ratio, diabetes mellitus, waist/hip circumference ratio, alcohol consumption, consumption of fresh fruit and vegetables, exercise and psychosocial stress. A tenth factor, a family history of CHD, is also given in the paper but was omitted from the list of nine as it had minimal impact on the PAR. It has been included here as it enhances the individualization of the calculation regardless of the overall impact on the calculated population mortality. The nine risk factors identified in the INTERHEART study are shown in Table 3 along with the unadjusted odds ratios. The risk factors identified in the INTERHEART study, their definitions and odds ratios. We use an odds model in which the impact of risk factors on an individual's risk for CHD death is determined as the product of a set of coefficients, one for each risk factor. The coefficients (the log of the normalized odds ratios, LNOR) provide a measure of the influence of the measured risk factor for that individual. 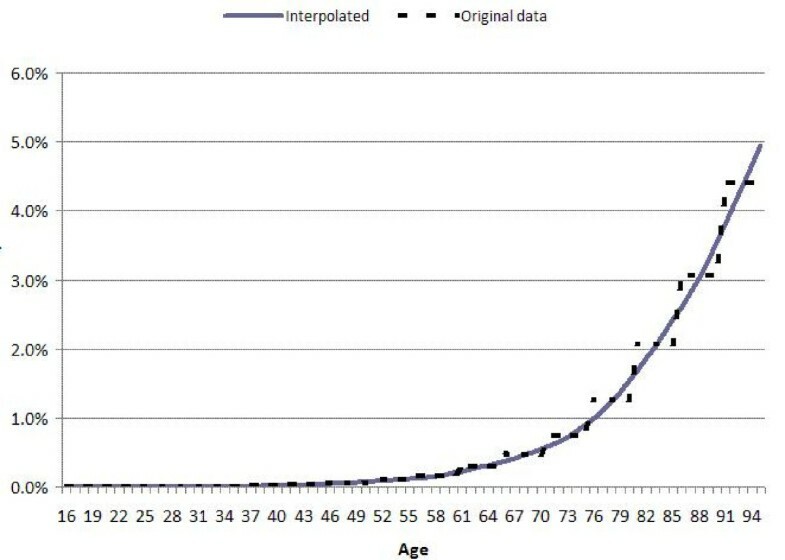 The population mean values were derived from the Health Survey for England 2003 for different gender and age groups, with the values interpolated using polynomials; details are given in tables 4. The following subsections detail the calculations of the LNORs for each of the risk factors used. Total cholesterol (TC) and high density lipoprotein (HDL) values are the most common measures of lipid level used in calculating CVD risk. However, the INTERHEART study found that using the ratio of apolipoprotein B (ApoB) and apolipoprotein A1 (ApoA1) is a more sensitive measure of risk than the TC/HDL ratio. The INTERHEART study explored the relationship between the deciles of ApoB/A1 ratio and the odds ratio for MI compared to the first decile. The relationship is plotted on a doubling scale in the original paper, but it would appear that the relationship between the odds ratio and the ApoB/A1 ratio is linear from the second decile upwards, but with the odds ratio having a floor of 1 from just below the second decile. 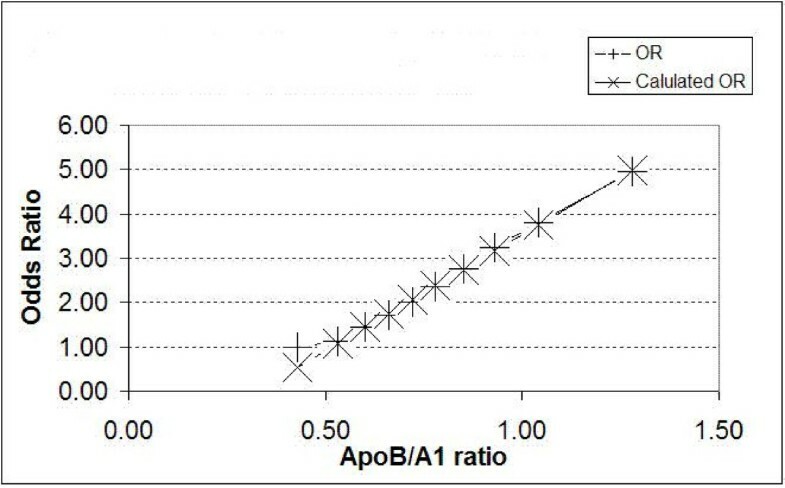 This can be seen in Figure 2.
showing the relationship between the odds ratio for first MI and deciles of ApoB/A1 ratio with respect to the first decile. where x is the ApoB/ApoA1 ratio. 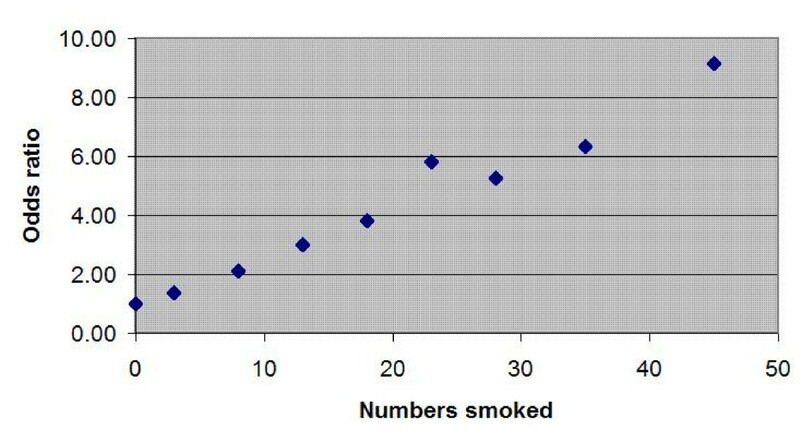 showing the relationship between the odds ratio for first MI and cigarette consumption with respect to non-smoking. where N is the daily cigarette consumption. The odds ratios given in the INTERHEART study are for self reported hypertension only. We can make an estimate of the odds ratio by systolic blood pressure versus the average systolic in a non-hypertensive if we assume that the odds are proportional to changes in the systolic blood pressure, and if we know the average values for the hypertensive and non-hypertensive groups. This information was not available to us, so an estimate needed to be made from another source. The average systolic in the ASCOT study was 164 mmHg, which was also the value in a study of home monitoring of Danish hypertensives. [27, 28] This seems to be a reasonable estimate for the hypertensive group. Estimating the average value in the non-hypertensive group is more difficult, as this is highly dependent on age and gender. However, a value of 130 mmHg was used as this would be a typical value in the 35 to 64 year old age group in the Health Survey for England. Armed with the gradient of the line and the intercept, we can calculate the odds ratio for any systolic blood pressure with reference to the assumed normal value of 130 mmHg. The individual odds ratio, IndORSyst is calculated using the individual systolic blood pressure, and the population odds ratio PopORSyst is calculated using the average systolic blood pressure for that age. The LNOR ξ for systolic blood pressure can then be calculated using equation (2). The model was implemented first in Matlab and then in Microsoft Excel to ensure freedom for errors. Here we will describe a worked example. We will find the 10-year coronary heart disease risk for a 57 year-old non-diabetic male who smokes 30 cigarettes a day with no personal but a positive family history of cardiovascular disease, a systolic blood pressure of 137 mmHg, a total cholesterol (TC) of 6.2 mmol/l, a high density lipoprotein (HDL) of 1.3 mol/l, and a body mass index of 21. He neither drinks regularly nor exercises. He can give no reliable information about his mental health or fruit and vegetable intake. The ratio is not known in this case, so must be estimated from the TC/HDL ratio using equation (6). The odds ratio (OR) for the individual is calculated in the same way. As this is less than 1.0, the individual WHR is taken as 1. PopORWHR = 1.3207 using the same formula. There is no information available for either of these risk factors, and so an assumption is made that the individual is exactly average for the population. As that means the difference between the individual risk factor value and the mean population value is zero, the LNOR will be zero. Converting this probability to odds, the value remains at 0.0048. This exercise demonstrates how published information can be used to construct a mathematical model of cardiovascular risk. The same methods should be applicable to other disease groups where there is sufficient information available. The method requires: the odds ratios for each of the risk factors when controlled for all other risk factors; mortality rates and prevalences for the diseases of interest; and prevalence rates and mean values for the risk factors in the relevant population. Before use, this model must be tested in different populations to assess its accuracy. The results of the INTERHEART study would suggest that it should be applicable in different geographical locations and to different ethnic groups without adjustment, since the predictions are anchored in a dataset for which there is a great deal of information on mortality rates and mean values. The INTERHEART study would suggest the residual variation at a population level is significantly less than ten percent. However, it should still be possible to apply the same principles by substituting the mortality data and the prevalence data for any population where that information is available to improve accuracy. A major advantage of this model is the comprehensive set of independent risk factors used. It is likely that other risk factors have very little residual independence once all these factors are taken into account. For example, social and economic deprivation is included in other CVD and CHD models such as QRisk and Assign. [9, 10] The INTERHEART study was conducted in 52 countries including low and middle income countries, and yet this factor did not emerge as significant when all nine risk factors were included. Equally, country and ethnicity did not remain as independent risk factors suggesting that the odds ratios derived are applicable in all 52 countries. It would seem plausible that the odds ratios are also applicable in countries not included in this study. A large number of assumptions were made in the construction of this model. The more important assumptions that might limit the accuracy of the model are described below. The odds ratios for the different cardiovascular pathologies should be highly correlated because there is a common underlying process at work, the formation of atheroma. However, there may be variations that are specific to certain pathologies, such as atrial fibrillation and stroke. In the INTERHEART study the subjects had experienced a first MI. Factors such as blood viscosity have a greater impact on MI than chronic ischaemia. It is possible that some of the modeled risk factors – such as psychosocial stress – may affect MI and chronic ischaemia, in different ways. We assume that the risk factor profiles and odds ratios for those risk factors are similar in those who die from an MI before reaching hospital and those who survive. In a cross-sectional study like INTERHEART, the outomes are not entirely equivalent to the prospective predictions of death from MI or CHD. In the INTERHEART study, subjects were identified on presentation with a first MI. Many potential subjects will have not survived to be recruited into the study. If there are significant differences between those that survive to hospital and those that don't, then some error will be generated in this model. We assume that the pathological processes affecting progression of asymptomatic, mild atheroma to symptomatic, moderate atheroma, are essentially the same as those causing further progression of existing moderate atheroma, and that the scale of effect of the different risk factors is the same at all stages of disease. This is not necessarily true, different risk factors might have particular significance at difference stages of disease. For example it is possible that some risk factors have a particular role in plaque rupture, or thrombus formation, and less in plaque formation. The INTERHEART study found that, once all nine final risk factors were included, country, and ethnicity and socioeconomic group did not have a significant effect. The well recognized ethnic, geographic and socioeconomic differences on CVD must therefore be mediated by the included risk factors. To apply the odds ratios to a given population, what we require, is the mortality rate in that population and the average value for all the included risk factors in that population at that time. We have used the mortality of CHD in the UK in 2003, and the average values for the risk factors used, in the UK in 2003. These will differ from the mortality and average risk factor values in the INTERHEART study. However, if this result of the INTERHEART study, that the odds ratios apply regardless of geography and ethnicity, is robust then this should not affect the results. With regard to the systolic values for hypertensives and non-hypertensives, this is very uncertain whether this assumption is accurate, but is based on data from two different countries, and would seem to be reasonable assumptions in the absence of better information. Data on the precise values in the INTERHEART study would possibly improve the model and increase confidence in it. The systolic blood pressure was modeled here with an assumption of a linear relationship with the odds ratio. However, the results in Lewington et al 2002 would suggest that the age-adjusted absolute risk varies on a doubling scale with systolic blood pressure  and, previous work would suggest that this linear relationship does not hold for very severe hypertensives. The INTERHEART study was unable to determine the relationship between the systolic and odds ratio adjusted for all nine risk factors and so we felt an assumption of a linear relationship was reasonable. This is a weak assumption, and based on a figure after Kannel. Different types of existing cardiovascular disease will have different degrees of impact on risk. The figure found by Kannel may be an average of these differing values. The value of this assumption will need to be tested in an evaluation of the model on external data. The odds ratios given in the INTERHEART study relate to the occurrence of first MI, and the risk factor data was collected at that time. It is unclear how those odds ratios differ over time and with the age of subjects. Also, older subjects will have higher risks of competing causes of death, and this may in turn affect the odds ratios for the risk factors predicting CVD. Using a wider range of risk factors can reduce the accuracy of the model if the available data on the additional risk factors is poor. Models developed using fewer risk factors embed information pertinent to the missing risk factors within the regression coefficients for factors that interact with the missing risk factors. With the larger models, the coefficients will have been regressed in the presence of those risk factors and so if that information is missing – for example if patients' fruit and vegetable consumption is not recorded in a dataset – their effect is lost to the model. Body mass index is used an approximation to waist-hip ratio, and TC/HDL ratio as a proxy for ApoB/ApoA1 ratio. Use of these proxy measures will reduce the accuracy of the model and waist-hip ratio and the ApoB/A1 ratio should be used in preference, when available. Individuals at high risk of CHD are often at high risk from competing causes of death. Consequently, some individuals at high risk may die from another cause prior to a predicted CHD event. This could lead to overestimation of risk from CHD in those at highest risk. Our method takes a population mortality rate and prevalence rates for CVD and adjusts them using the mean values for risk factors in the given population. This is valid provided the distribution of risk factor values is not heavily skewed and the relationship between the risk factor values and mortality rates obey the assumptions described above. This paper demonstrates how a comprehensive, mixed odds model can be constructed using widely available information and without access to training data sets. The method could be useful in modeling a broad range of disease areas. Further research needs to be done to evaluate the accuracy of the model in different population groups using historical cohort data. We would like to thank Professor Salim Yusuf, Dr Sumathy Rangarajan, Dr Michelle Zhang, and Dr Anika Rosengren from the INTERHEART study for supplying additional information. Particular thanks go to Dr Elizabeth Murray for project management. The Essex Primary Care Research Network has been supportive financially and morally, in particular Oksana Hoile, Caroline Gunnell, and Jonathan Graffy. Finally, we would like to acknowledge the contribution of the reviewers of the paper (Dr Randi Selmer and Dr Gil L'Italien) whose observations were exceptionally valuable. Dr Martin is the author and owner of the intellectual property rights of the Laindon Survival Model. He also works for RMS Ltd, a risk modeling company. CJM conceived of and designed the model, and is the principal author of the paper. PT supervises CJM's PhD and contributed to the paper. HWWP gave statistical advice and contributed to the paper.